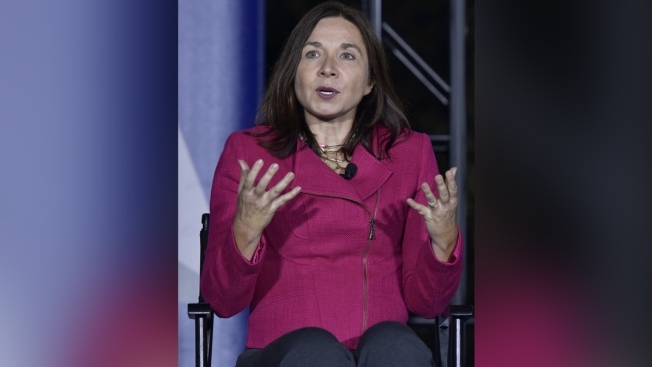 Climate scientist Katharine Hayhoe speaks during a discussion on climate change at the South by South Lawn festival on the South Lawn of the the White House on Oct. 3, 2016, in Washington, DC. One of the authors of the latest federal climate assessment, which warns of severe consequences for the country’s economy, environment and public health from global warming, quickly pushed back Tuesday against the White House press secretary’s statement that the findings were not based on facts. Katharine Hayhoe, the author of the report’s climate scenarios chapter and co-director of the Climate Science Center at Texas Tech University, accused Sarah Huckabee Sanders of misrepresenting the report. Hayhoe challenged the same assertion from the White House earlier, tweeting that the report had considered a very broad range of scenarios. The National Climate Assessment, mandated by Congress and produced by 13 federal agencies and outside scientists, warned that natural disasters were worsening because of global warming, threatening hundreds of billions of dollars in losses. Trump, who has mocked climate change science, wants the United States to use more coal and roll back environmental protections put in place by the Obama administration that would restrict greenhouse gas emissions from vehicle tailpipes and from power plants. Interior Secretary Ryan Zinke had similarly questioned the report, describing it as extreme and worst-case. Hayhoe did agree with Sanders that modeling was complicated and said that was why she had a section on “Potential Surprises,” which included the worrisome conclusion that models tended to underestimate temperature change. Models have done a “darn good job of reproducing observed changes,” Hayhoe added.